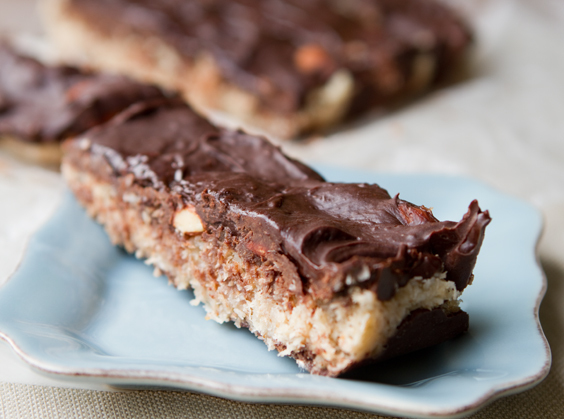 Joyfully Vegan Coconut Chocolate Almond Bars! 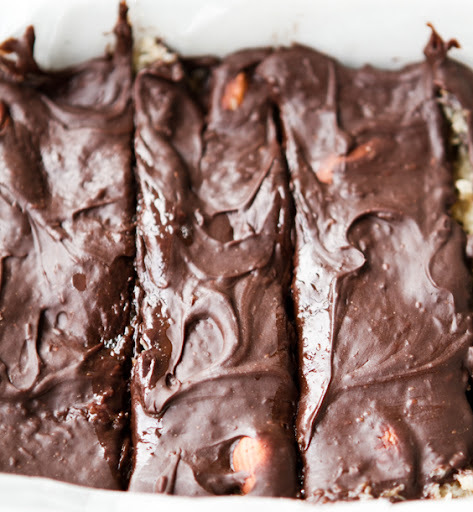 More homemade, vegan Halloween candy bars! I was inspired to veganize another bar when I read the many comments you guys left on my Peanut Butter Cups post/giveaway. 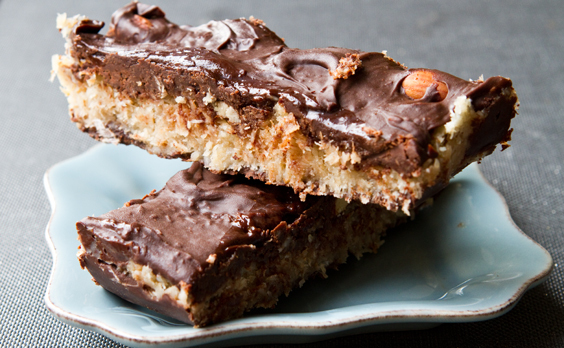 I asked you all what your fave candy bar was on Halloween (pre-vegan memories for most of us). The answers: lots of Snickers, Reeses, Almond Joy, Sour Patch Kids and more. 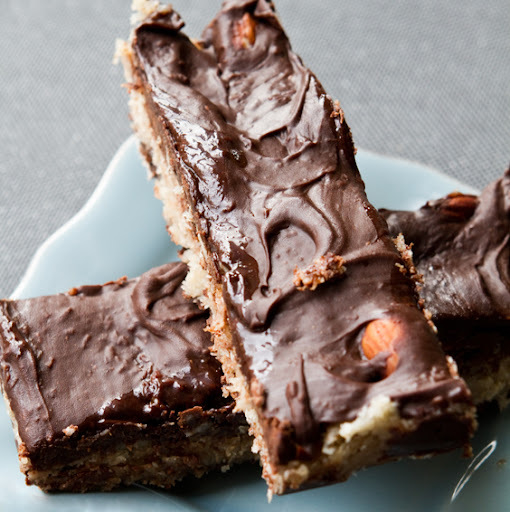 So for your Halloween enjoyment, here's my veganized take on "Almond Joy" bars. 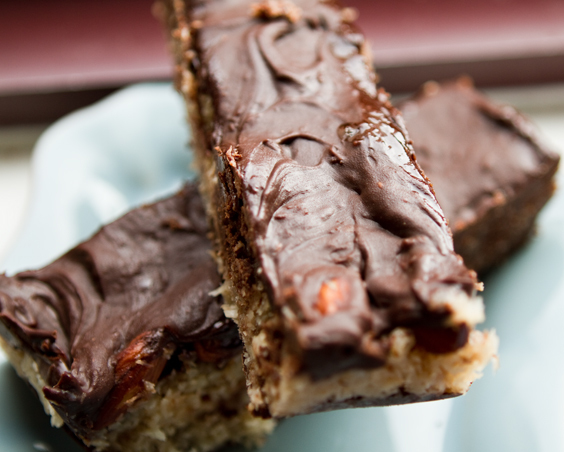 I call them my "Joyfully Vegan" Chocolate Coconut Almond Bars. I was very impressed by these bars. 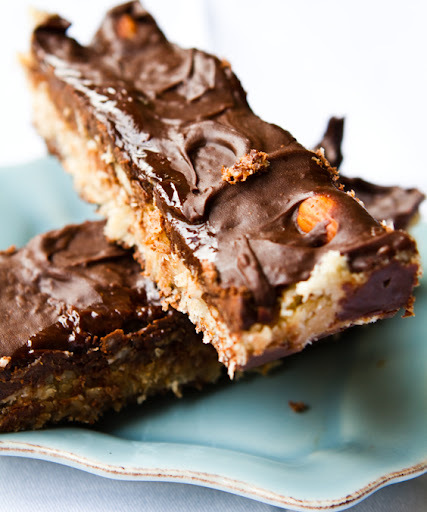 Chewy, sweet, buttery, toasted coconut filling, crunchy almonds and a swirled coating of vegan chocolate. Dive into this joyful bar!.. 1. In a saute pan, add the coconut to dry pan. Toast and stir around over high heat for a minute. 2. Reduce heat to medium and add in maple syrup, sugar, vegan butter. Stir around to melt butter. 3. Add in the coconut milk and continue stirring until coconut browns a bit and absorbs all the liquid. 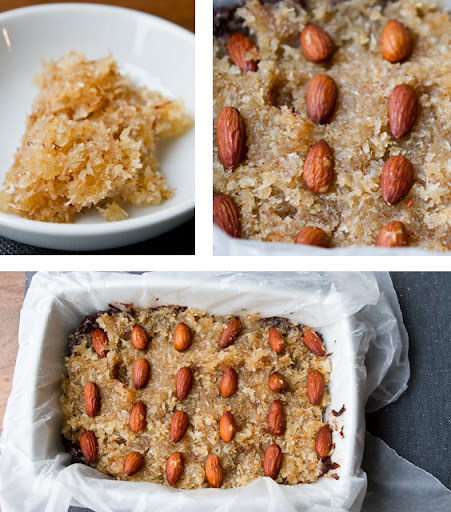 Do a taste test and add another splash of maple syrup if you like a sweeter filling. Turn off heat and set aside. 4. 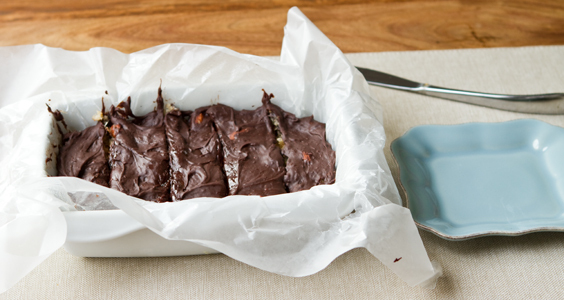 Line a baking pan with wax paper. I used a dish about 4" x 8". 5. Add all chocolate ingredients to mug. Microwave for 25 seconds. Remove mug and stir briskly until all the chips melt. Heat for another few seconds if needed. You acn also use a double broiler if you'd prefer. 6. 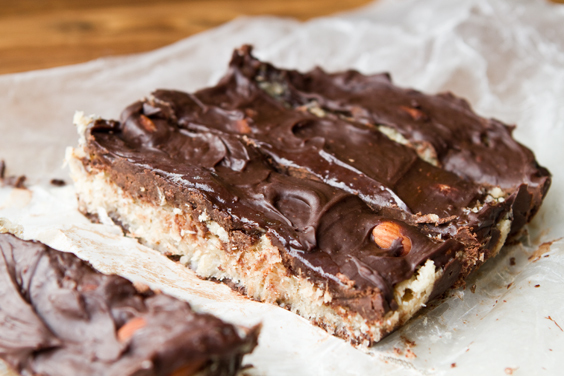 Spread a very thin layer of chocolate on bottom of wax paper. Add add the coconut over that and spread to about a 3/4" thick layer. Dot in the almonds. Spread a thicker layer of chocolate - carefully fo you do not disturb the coconut. Swirl to smooth. 7. 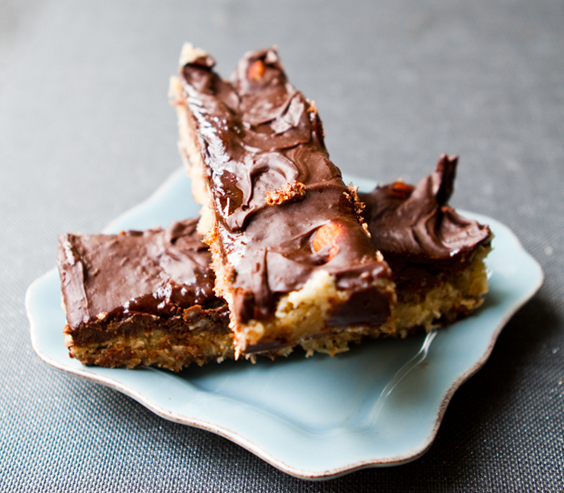 Spray a butter knife with oil and slice the filling into bars - this will make them easier to slice out of the freezer. 8. Freeze for about 20-30 minutes - or overnight. 9. Thaw for a few minutes before slicing and serving. 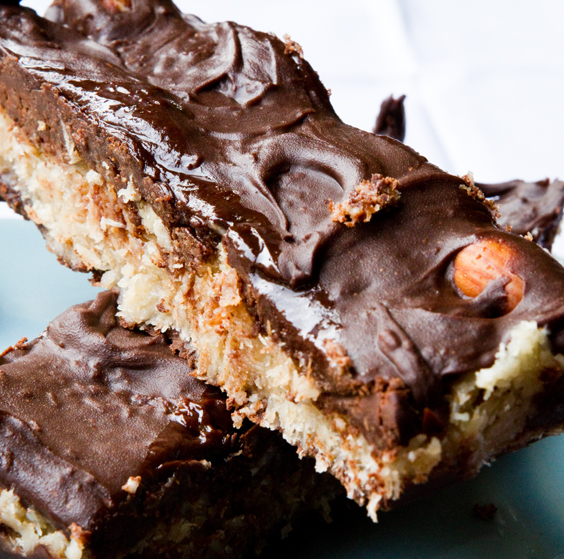 Slice into smaller bites for bite-size candy. ps, don't forget to enter my Halloween Candy Treat Bag giveaway here.